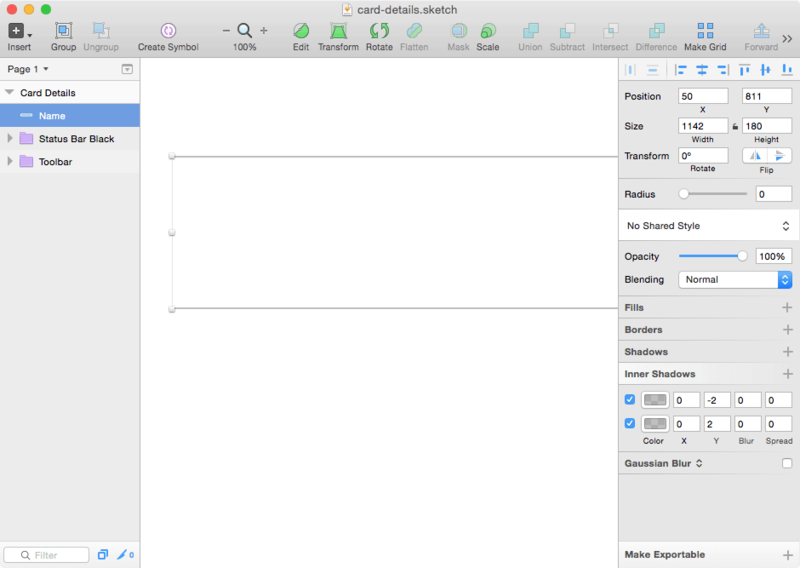 You’ve likely heard about the Sketch App design tool for Mac, its intuitive usability and why user interface designers are switching over. It’s on version 3.2.2 and only $99. If you haven’t tried it out yet, it’s about time you did, especially if you’re one of those that complain about the sluggishness of Adobe software. 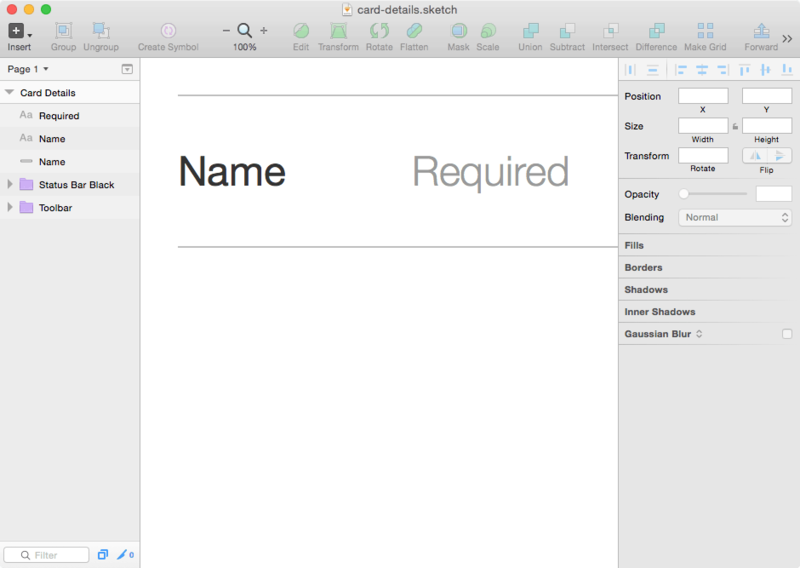 Sketch 3 is incredibly lightweight and splendidly fast. Grab a trial version here. 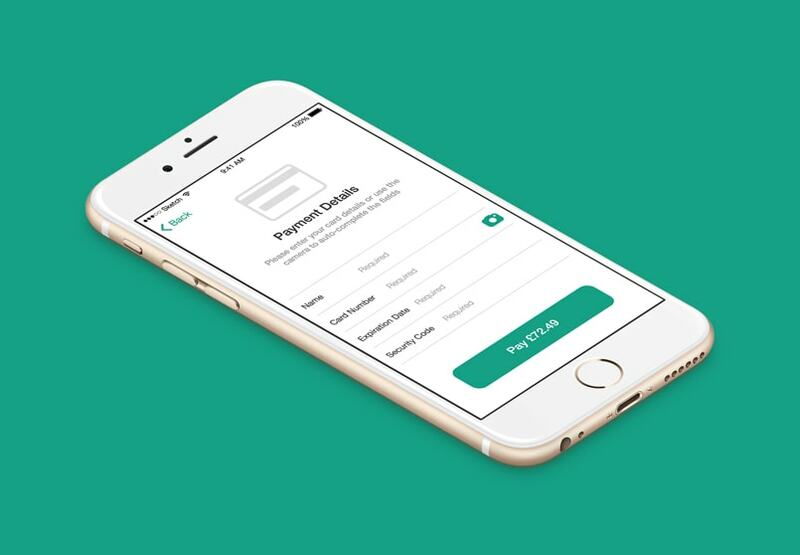 In this tutorial, we’ll create a card details app screen that takes advantage of iOS 8’s credit card scanning features. You might remember a similar feature from iOS 7 where you could scan iTunes gift cards with the camera as an alternative to tapping in the lengthy string of digits. With the new card details feature the user inputs credit card information into the iOS device settings beforehand, so only a quick-tap is required to autocomplete the form fields when the user wants to make a purchase. The image below shows a screenshot of what we’ll be making. Lets begin by opening up the Sketch app and tapping “A” on the keyboard. Sketch keyboard shortcuts are refreshingly easy to remember, and this one is short for “artboard.” If you have experience in Adobe Illustrator or other vector tools, this terminology should be familiar. In the right-hand sidebar you’ll notice that iPhone Screens has already dropped down for you. Select the first option, Portrait — 6 Plus. Now that we have our iPhone 6 artboard we’re going to drop in a couple of UI assets that are instantly available in Sketch from the word go. Navigate to File → New From Template → iOS UI Design. 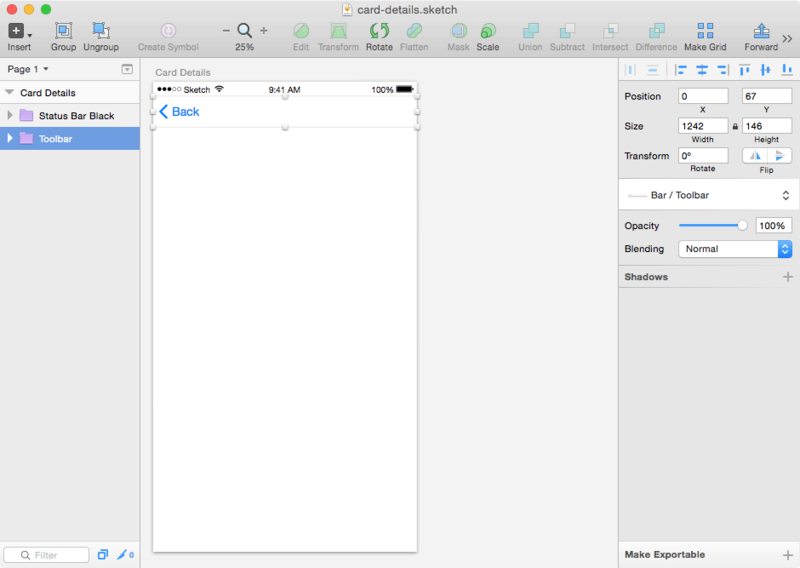 A new Sketch window will open up with an abundance of iOS UI assets. To use in our app screen, we’ll need to copy these assets into our artboard; a classic copy and paste will work flawlessly. From the left-hand “layers” sidebar, copy both Toolbar and Status Bar Black into our iPhone 6 artboard, and close the UI assets Sketch window since we won’t be needing it again. You may have noticed that the assets are a little too small, but that’s fine. We’re working with vectors, so we can upscale these layers whilst maintaining crisp quality. Click on one of the layers to see its style attributes in the right-hand sidebar, make sure the tiny padlock between Width and Height is locked, and set the width to 1242. There, that’s better. When you’ve repeated this step on the other layer, drag both to the top of the artboard and check the image below to make sure we’re up to speed. Now we’re going to learn a new shortcut, “R” for Rectangle. Draw it out and confirm in the right-hand sidebar that it is 1142px by 180px— this allows for a 50px margin either side of our text field. We don’t want to stretch the form across the canvas but we do want to use the large iPhone 6 screen effectively; this is to reduce overflow on text fields where the values are lengthy and often cut off. Just like in any other design tool, you can double-click a layer in the layers sidebar to rename it, which I’ve done. Now lets style the text field. Since (annoyingly) Sketch 3 doesn’t allow single-sided borders, we’ll have to make use of the Inner Shadows attribute. So untick Borders (and Fills while you’re there) and instead add an Inner Shadow. The values available are X, Y, Blur and Spread (like in CSS3). Replace the default settings with 0, -2, 0, 0 and change the default opacity of the Color to 25% to make the border more subtle. Now add another shadow, exactly the same, only change that -2 to just 2 — our text field now has an artificial top and bottom border. See the image below for reference. If you zoom-in to 100% (CMD + “+”) the text field should look like this. Now we’ll split the text field into three sections (not literally, but in our minds) consisting of a label, placeholder and optional space for an icon. Why? It is the default behavior of a placeholder to disappear when we focus on a form field, and we can often forget what information we were supposed to provide after the placeholder hint goes away. This is why its best practice to have both a label and a placeholder — the label tells the user what information the form needs (e.g. “First name”) and the placeholder either offers a helpful hint (e.g. “Edgar Allan Poe”) or tells the user that the field is required. Duplicate this text layer, but change the Weight to “Light” and the Color to #999. Placeholders do not carry the same weight of importance in a form field, therefore they don’t require the same typeface weight either. Since we’re going to use these styles again, we can Group them together. Select each form-related layer from the left-hand sidebar while holding shift and then use Group from the top menu. Now we can create multiple text fields by using CMD + D to Duplicate. However, the remaining form fields do not require that top border, so lets go and remove that before we continue. You would have noticed that one of the labels’ is longer than expected and overlaps the placeholder. There should be a short amount of space between the two, however each placeholder also needs to align vertically, so create the other two form fields and then position the placeholders relative to the longest label (this will be the expiration date). Interesting fact: Extra fields such as start date, issue number and address were only required by legacy systems. Modern applications only require these four fields. Do you remember how we used the Group feature? Now we need to place the four form field groups into another group of their own — we’ll call this “Form” and drag it right into the center of the artboard for now. Red lines will appear on the canvas to illustrate when Sketch is able to snap-to a logical position in the artboard. Lines appearing both horizontally and vertically will indicate a true center alignment. If you were designing this app screen without a tutorial you wouldn’t know about the X and Y positions, so here’s a quick tip: moving a layer with the directional keyboard buttons while holding shift moves it by a factor of 10px instead of 1. After adding the text (weight: medium; color: white; size: 68), you should have something that resembles the screenshot below. Notice the back button and its icon counterpart have been updated to fit our brand. By looking at the form labels and button text you can deduct that this screen’s objective is to collect your card details, but it isn’t immediately obvious. Some visual aids will help the user understand the goal of the form more clearly, which is to pay for the item in the quickest and simplest way. Since we pay for things online with a credit card, an icon representing that would be most appropriate. If you’d like to take a stab at creating your own icons I won’t stop you. After all, we’ve learned how to create shapes and style them, but many would call this reinventing the wheel. Instead we’re going to find icons that are close enough to what we want and shape them to compliment our app’s design. Sketch App Sources and Dribbble are two splendid websites for finding free Sketch resources; I’ve chosen this icon set by Phil LaPier. We used Sketch App’s built-in iOS kit at the beginning of this tutorial — the lessons learned there are completely applicable. Copy the brand-less blue card icon from Phil’s artboard into our artboard and make sure the Size is 384 x 264. At this stage we’re adding a lot of new layers to the canvas. Just as if you were working in any other design app, we need to take a moment to clean up. Get in the habit of renaming layers and grouping related layers together; after that it will be much easier to move groups of elements around the artboard, which is exactly what we need to do now. Look at the mockup below and position the layers in your artboard until both app screens look relatively the same. Simply dragging layers to activate the snap-t0-grid features will accomplish most of this. Tip: The form should be about 200px above the submit button and the credit card icon should automatically snap to the bottom-center of the navigation. As mentioned at the start of this article, iOS 8 lets you store credit card details on your iPhone to save you tapping in those details every time you want to make a purchase — this is done by scanning your credit card with the iPhone camera. CNET demo’s this feature in a very short video. However, there are downsides. Since the CVC/security code is located on the back of the card it has to be input manually; since the feature is activated from the keyboard interface, it cannot be used in conjunction with third-party keyboards. These are minor setbacks. A camera icon has been added to the form in our brand colors. It does not (because it can’t) invoke the camera in any way, as this can only be activated from the keyboard when you tap “Scan Credit Card,” but it does let the user know that this feature is available. Perhaps the user will immediately notice the card scan feature when the keyboard interface pops up, but it can’t be guaranteed that they will; so we’ll add the camera icon to make sure. By now you should be comfortable copying-in UI assets from other .sketch files and changing styles such as color and size. If not, I would suggest revisiting the “visual aids” step where we imported the credit card icon. Prototyping is the most important stage in any design project. I did not construct this app screen on my first try, but in fact I tried many different variations before I found the best user experience. Reiteration is invaluable in the design process and Sketch App 3 makes it a breeze to try out colors, fonts and styles in a short time frame. Hopefully the skills in this tutorial have been indispensable. You might find creating and editing vector shapes a little more difficult, however Sketch App makes this as simple as can be (maybe we’ll cover that in a future tutorial). If you are in fact a beginner, what were your first expectations of Sketch and did it match those expectations? If you have used Sketch before, did you come across any useful Sketch tutorials lately? If you’re feeling confident about designing real life apps in Sketch you’ll want to know how to export those icons into a variety of iOS-ready formats. 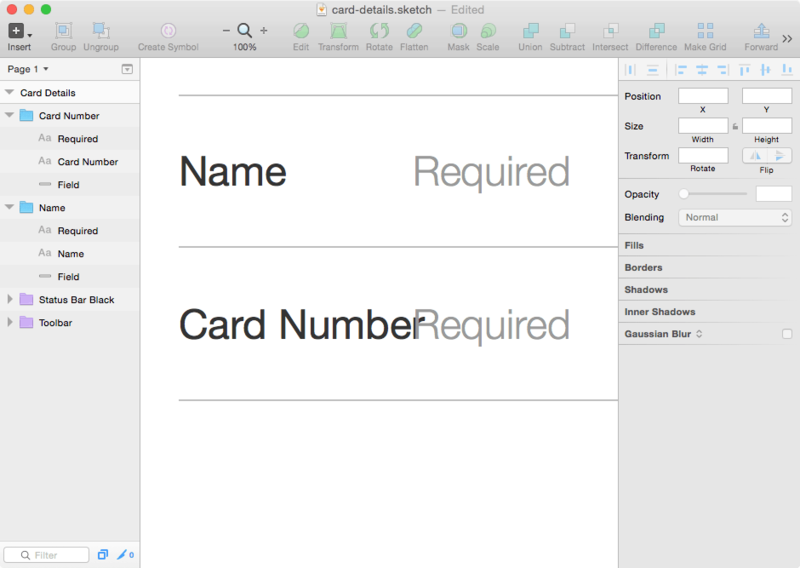 It’s easy and one of Sketch’s most acclaimed features. 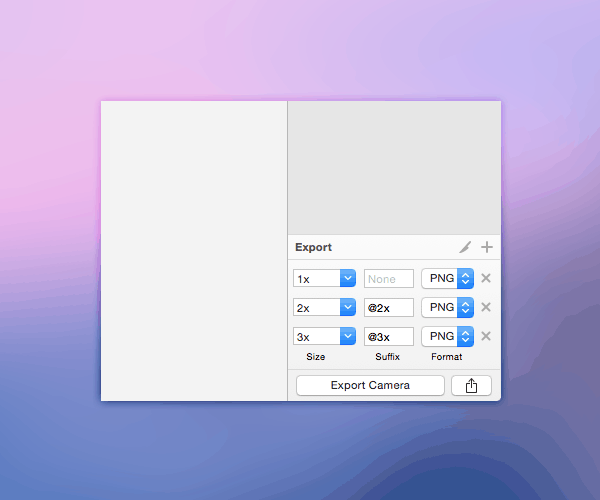 Select (from the layers sidebar) the layer or group that you want to export and click “Make Exportable” in the bottom-right corner of the window. Sketch will take care of the iOS asset naming conventions by automatically appending a suffix (@2x, @3x, etc) and saving as a non-lossy transparent PNG, which is perfect for small assets. 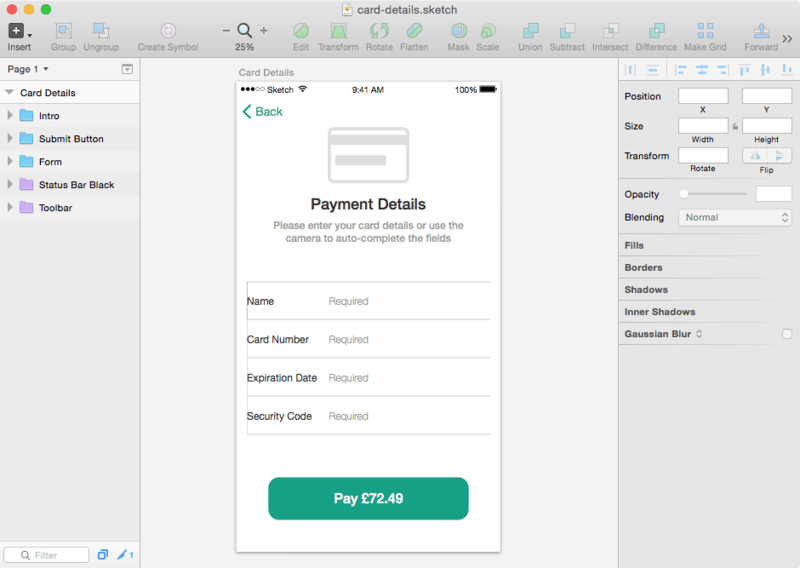 Great tutorial thanks – great for beginners to get to grips with some of the features of Sketch like myself. Hi Ruth, I am the author, thank you for the lovely comment. I will be writing more tutorials like this (writing one now actually) and in time we will come to cover features like layer masks, editing shapes, and maybe even creating large files like UI kits and using “Symbols” to save style sets. If you’re interested to read more of these tutorials you can follow me at @mrdanielschwarz or follow @designmodo and we’ll let you know when. Nice tutorial. I’d love to see a follow-up that describes how to get these into Xcode and have them be the right size for the various iPhone sizes, make buttons/textfields so they are in the appropriate area, etc. Maybe I could include this in a future article as a tip – thanks for the feedback. Gist: export as x1 for iPhone, x2 for iPhone Retina and x3 for new iPhone 6; you can then import these into XCode. From this tutorial the only assets would be the two icons, everything else would be native and could be controlled in a universal application with size classes. You mentioned in your reply to Dave that “everything else would be native and could be controlled in a universal application with size classes.” I understand the second part controlled via CSS etc. Please clarify the first part “everything else would be native”. Does it mean you still need to export in slices of the design to XCode? I am giving the trial version of Sketch a go. I seem to be getting a weird “bug” (Is it a bug?) where when I resize a UI element in an artboard it resizes (and makes any other changes I make) it in the original UI toolbox. I assume this is so you have a UI toolbox that is consistent with the changes you make, but in practice when you are resizing elements for 6 Plus, it makes for a pretty messy master UI board. I’m not 100% sure of what you mean. Do you mean that if you change the Status Bar Black (for example) in your app screen it too will change in the iOS UI Kit? It sounds like you have both your app screen and iOS UI kit in the same .sketch file? A way to overcome this is to select the UI element and choose “No Symbol” in the layers sidebar – I hope this helps. Please forgive me if I’ve misread your question! Same problem here. Were you able to resolve your issue, Elliiot? I’m locked for the last day trying to understand how to use the scale the symbols from the supplied template kit in an iphone 6 size artwork without resizing (and breaking) the source elements. 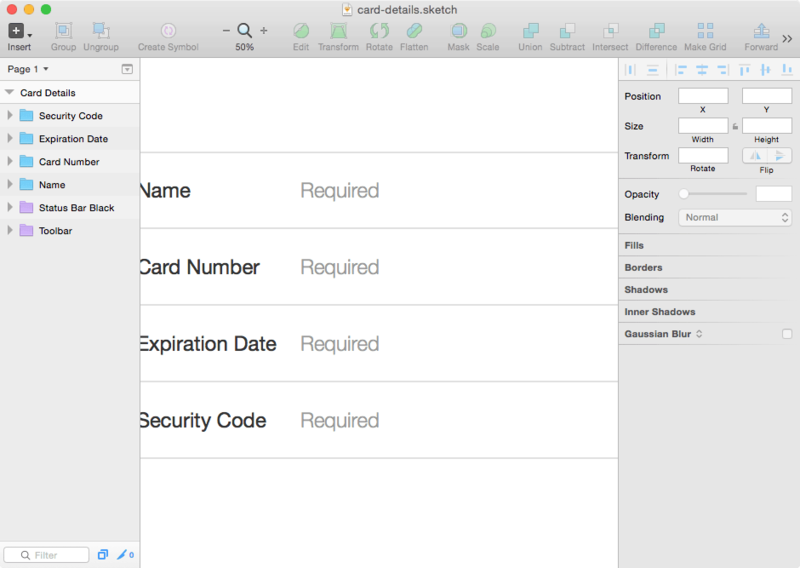 Daniel, I also cannot find this “No Symbol” option in the layers sidebar of Sketch 3. Any tip? Awesome tut! 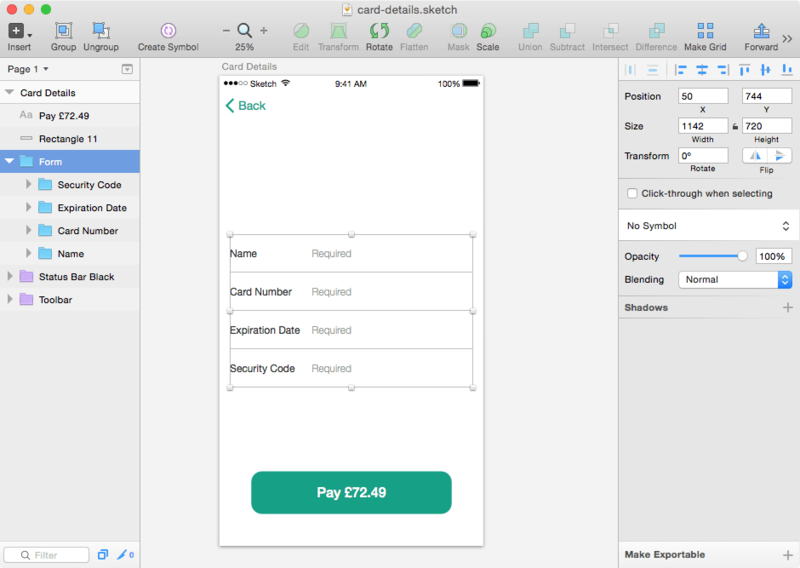 Just bought the license to start using Sketch full-time and went through this tutorial. For some reason I can not find decent tutorials on image cropping. Do you think you could write one up? For folks like me that are jumping ship from Photoshop, cropping images is a must. If I have to make serious edits to an image I will fire up Ps but cropping usually is what I need in Sketch. I’ve been meaning to write this up, but there’s already two articles from myself that are due to appear on Designmodo, so it might be a while – until then, try these tips. Double click on an image, I think a crop function should appear. If not, try masking as an alternative method? Hope this helps, at least in the meantime. Okay, here is an issue, when I put that 1142 and 180 width and height for the form field, they are going off the canvas, I don’t understand why? Is it default to “px” ? do I need to change something? My iPhone 6+ Artboard width is not that 1142px. Perhaps you selected the wrong artboard? Sketch for some reason lists the iPhone 6+ template at W:414 H:736. If we multiply these numbers by 3 we get 1242 x 2208 px. Should we simply increase the size of the template to this? Sorry, I should have been a lot clearer. If you increase the artboard x3 then you export as 1x, or else you keep the artboard at its default size and export as 3x. My reason for upscaling the artboard is so I can make sure that the bitmaps are crisp. Another way to overcome this is to convert bitmaps to vector (double-click the bitmap image).